Order yours today! Check out our Etsy site or contact us today! Want something one of a kind to call your own? Work of Arc Welding can create something uniquely yours out of the materials you choose, just as long as you choose metal! Check out amazing pieces of the past, and see what we can make for you. Looking for that perfect accent to complete a room, or starting from complete scratch? Work of Arc Welding has created amazing decor that suits any home, office or public space. Lighting always sets the mood of any space, but a unique lamp can truly set a space apart. 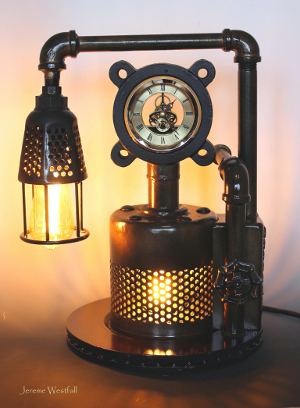 Industrial, Steampunk, reclaimed, modern, or maybe something indescribable! Just because you use something everyday, doesn't mean it needs to be everyday, let Work of Arc make the lighting piece that makes your place! Don't just display your books or collectables, make them a part of the room with shelving, or other wall hanging or free standing display options. 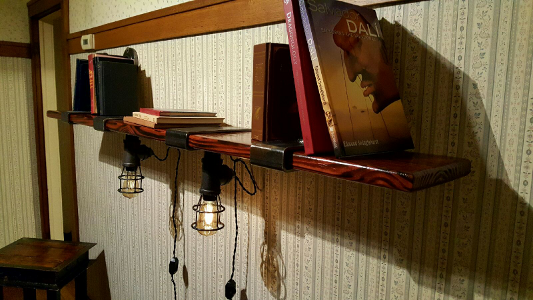 Bring lighting to shelving to make a comfortable reading area, or shine a light on your collections! Enjoy a fine wine? Let your guest see just how fine! 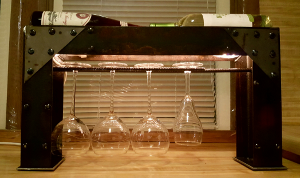 Wine racks and glass holders don't have to be hidden in the kitchen or cellar when they look this good! And of course, don't forget to light up those bottles and glasses for late night sipping! Who doesn't love Cleveland right now? With two championships from our CAVs and Monsters already and another on the way from our Indians, Work of Arc just had to show off our hometown pride! 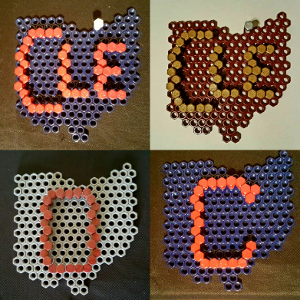 We've made these uniquely Cleveland, nuts and bolts wall or shelf pride art pieces to put anywhere you want to show you believe in the land! Check out our Etsy site or email us to order today!